(Phys.org) —A team of researchers from Grenoble University in France has found that under experimental conditions, roughly half of the noise created by drying wood is due to cavitation. The team made this discovery while studying the noises trees make in drought conditions. They presented their findings at last month's American Physical Society meeting. Scientists have known for many years that trees make noise, and not from just the creaking that occurs as wind pushes them back and forth. 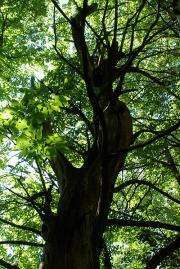 Trees also emit noise that is too high in frequency for the human ear to hear. Past research suggests that the noises trees make change if they're not getting enough water, and at least some of that noise is likely due to cavitation. Cavitation occurs when air bubbles form in the tubes (xylem) that run up and down tree trunks, preventing water from being pulled upward—in some cases it causes the tree to die. What has remained a mystery, however, is how much of the noise coming from trees during times of drought stress is due to cavitation, and how much from other sources, such as cell breakage. To find out, the team in France cut very thin slices of wood that preserved the xylem structure, and soaked them in a special gel that mimicked the wet environment of a living tree. Then, the researchers slowly exposed the wood to dry air, creating drought-like conditions, all the while making both audio and video recordings of what occurred as the wood grew drier. In so doing, they found that at least half of the noise emitted from the drying wood came from cavitation. They also found that the sounds made by cavitation were distinguishable from other sounds made by the wood as it was drying out. Gaining a better understanding of the noises trees make under different conditions is important because it could one day provide a means for diagnosing ailments, most specifically, how close a tree is to dying when it's not getting enough water. Knowing which sounds to look for when studying trees living in regions where weather is changing due to global warming can help with forestry management—early detection, via a type of tree stethoscope, could alert authorities to problems before they become too difficult to solve. Under hydric stress, in dry weather conditions, the sap within trees may reach extreme negative pressures and cavitate: bubbles appear, which eventually causes an embolism in the circulation. It has been shown that cavitation is associated with short acoustic emissions, and they can be recorded in the ultrasound range. However the precise origin of each acoustic emission is still not clear. In particular, the acoustic emissions could be not only the consequence of cavitation, but also of the collapse of xylem conduits, or of fractures in the wood. Here we present an original set-up where we can simultaneously record (i) the acoustic emissions, (ii) the location of cavitation events, by imaging the sap channels under light transmission microscopy. We are then able to correlate the sounds to the visible changes in channels, such as the appearance of cavitation bubbles. We hope the results of the present study might help to better understand the acoustic signals emitted by trees, and to obtain further information in the evolution of wood under dry stress conditions.